2. Tryk på Open og find mappen, hvor brushen ligger. Marker brush'en. Hvis der er flere, du vil importere, kan du markere dem alle. Choose Open and find the folder, where the brush i placed. Select the brush. 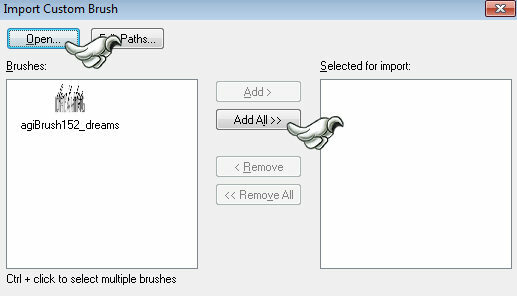 If there is more brushes, you want to import, you can select them all. 3. Brushen ligger nu i venstre kasse. The brush is now visible in the left box. Push Add All, and it appears in the right box. 4. Tryk Ok, og brushen er nu importeret og klar til brug. Hvis du har problemer med at importere, kan du i stedet eksportere brushes. Choose Ok, and the brush is now imported and ready for use. If you have problems importing brushes, you can export instead. 1. Åbn billedet, du vil eksportere, i dit PSP program. Open the brush you want to eksport in your PSP program. 2. File - Export - Custom Brush. 3. I boksen du får op, skriver du navnet på brush'en. In the box that appears, you write the name of the brush. Tryk på 'Edit Paths' og vælg den mappe, du vil eksportere brushen til. Tryk OK og brushen er klar til brug. 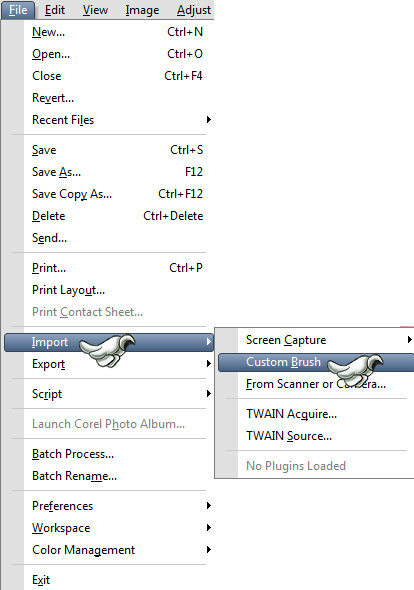 Push 'Edit Paths' and choose the folder, you want export the brush to. Push OK and the brush is ready for use.